Today is our last day before a year-end break, and what a year it's been. The Devils & Dust one-man show took us all on a "Dream" ride -- if he just wanted to see us smile, this sure was a nice way to show it. As in 2002 (another big touring year), Springsteen took a break from holiday shows this season... but you can't say he didn't provide us with a whole lot of merriment all year long, with seven months on the road and five -- five! -- shiny new discs to play. The Backstreets office will be closed through January 2; our online store will be open for ordering 24/7 as usual (in case Santa doesn't bring you everything you wanted), but the non-automated manpower will be taking a rest, and we'll reopen for business as usual on January 3. And a nice feeling of closure here, as we've just put the 25th Anniversary double issue of Backstreets Magazine, #83/84, to bed! So the little printer elves will be busy with their presses while we're away, and this 124-page issue (our biggest ever, by far) will be shipping out to subscribers in early January. Watch for more details about this special issue here in the new year. Ah, the new year: already, rumors are bubbling about major E Street Band activity in 2006... so visions of that will be dancing in our heads... what's the scoop? See ya next year and we'll figure it all out! Merry Christmas, Happy Hannukah, and have a safe and Happy New Year. Coming to the tellyvision in the new year: the January 8 episode of Cold Case on CBS will be a special one, featuring an all-Springsteen soundtrack. "8 years" is set between 1980 and 1988, and features nine of Bruce's songs from that period: "Stolen Car," "Drive All Night" "Atlantic City," "No Surrender," "Glory Days," "I'm on Fire," "Bobby Jean," "Brilliant Disguise," and "One Step Up." CBS' David Brownfield tells us it's "like an hour-long music video"; show creator and episode writer Meredith Stiehm says: "Because there are such vivid stories and characters in Bruce Springsteen's music, we decided to let the lyrics do a lot of the storytelling for us, instead of depending on dialogue." According to Brownfield, the episode was directed by Mark Pellington, who also directed Springsteen's video for "Lonesome Day." Tune in Sunday, January 8, from 8 - 9 p.m. ET/PT. Another small screen special is just a few days away: Springsteen will appear on Swedish TV (SV2) on December 23, interviewed by Per-Sindling Larsen just before he took the Hovet stage in Stockholm on 6/25/05. In the interview Bruce talks about his first time in the country 30 years ago, the legendary 11/21/75 Stockholm show; performance footage will include clips from Hammersmith '75 as well that Devils & Dust Stockholm stop. The "Studio Pop" program will re-air on 12/26 and 12/31. But no need to check it twice -- Springsteen is right there in the Top Ten of Rolling Stone's Top 50 Records of 2005. Devils & Dust comes in at #5, in fact: "tackling our new world order with nuanced, literary songs.... The effect is something like James Earl Jones reading Raymond Carver -- an American master and old friend plying his craft as a stalwart response to scary times, and because it just plain feels right." What are you doing New Year's Eve? Well, you can spend it with Steve Van Zandt at ESPN's New Year's Eve featuring Little Steven's Underground Garage, at the Hard Rock Time Square in NYC. Steve hosts, along with ESPN's Stuart Scott, with a bill that includes the New York Dolls, the Troggs, the Mooney Suzuki, the Chesterfield Kings, the Woggles, and the Charms. Tickets are available now at www.undergroundgarage.com and Ticketmaster.com, with 300 bucks getting you not only your socks rocked off, but also an open bar including a Champagne toast at midnight, and lots of grub (passed hors d'oeuvres, a 3-course buffet dinner, and a continental breakfast -- this thing runs from 8:30 p.m. to 2:00 a.m). If you can't make it, check it out live on tellyvision, on ESPN and ESPN2. After a resolution to honor Springsteen got shot down in the U.S. Senate, his home state stepped up: on Thursday, the New Jersey state Senate marked the BTR anniversary with a resolution honoring Springsteen for 30 years of "musical greatness." State Senator Raymond Lesniak said in a press release: "For the last 30 years, Bruce Springsteen has been a world ambassador for his New Jersey roots. It's altogether fitting that we pay tribute to 'The Boss.'" According to the Asbury Park Press, the Senator was "dancing and clad in a Santa Claus hat... [as he] tried to get the Senate chamber to sing along to Springsteen's version of 'Santa Claus is Coming to Town'" before the vote. And it still passed! At the same time, Sen. Lesniak introduced a proposal to create specialty "Born to Run" license plates, with proceeds going to the Community Food Bank of New Jersey. The bill has until January 9 to pass -- read more in the Associated Press. The 2006 New York Guitar Festival is next month, featuring three weeks of concerts from January 14 - February 8. Kicking things off is The Nebraska Project, honoring the Springsteen album with a gala opening-night concert in the World Financial Center Winter Garden. Performing songs from the album from start to finish will be Michelle Shocked (Nebraska), Jesse Harris (Atlantic City), The National (Mansion on the Hill), Chocolate Genius (Johnny 99), Martha Wainwright w/ Marc Ribot (Highway Patrolman), Dan Zanes w/ Vernon Reid (State Trooper), Laura Cantrell (Used Cars), Me'Shell NdegeOcello (Open All Night), Mark Eitzel (My Father's House), and Kevn Kinney w/ Lenny Kaye (Reason to Believe). Oh, and did we mention it's free? Also coinciding with the festival is By the Neck, an exhibition of photos by Danny Clinch, running now through January 30. Thanks again to everyone who kept us posted during the Devils & Dust tour, sending in show reviews and photos -- the help we receive from readers is essential. As we're compiling reports from the final leg, we're still looking for more reader reviews from the following shows: Uniondale, Minneapolis, Worcester, Providence, Richmond, both nights in Boston, Tampa, Norfolk, and Atlantic City. If you were at any of these shows and want to help out, please email your impressions to onstage@backstreets.com. Especially helpful are descriptions of the rarer songs played (tour premieres, etc. ), the "feel" of the show (especially compared to others you might have seen), things Bruce said to the crowd-- basically, anything that set the night apart. To send photos, ticket stubs, concert ads, handwritten setlists, etc., you can email scans to images@backstreets.com. MOJO Magazine hops on the Bruce radio train, with a "Bruce Springsteen Weekend" on MOJO Radio, to celebrate the 30th anniversary of Born to Run. On Saturday 12/17 and Sunday 12/18 between 9 a.m. and 5 p.m.(British time), MOJO Radio will be featuring a Springsteen track each and every hour; a one-hour program, Bruce Live in Concert, will air at 9 p.m. on Saturday and repeat at 11 p.m. on Sunday. MOJO Radio is available worldwide online at www.Mojo4Music.com, and in the UK also on Sky Channel 932 and Freeview channel 721. The radio special coincides with the massive Springsteen cover feature in their new issue, a great new interview by Phil Sutcliffe that covers "life, death, divorce, identity, America….the whole damn thing!" This January 2006 issue is out now, and currently in stock at Backstreet Records. December 12 is our "standard shipping" deadline: simply place your order by midnight tonight (11:59 Eastern, December 12) and Backstreet Records guarantees delivery to any U.S. address by December 23 at the latest. For orders placed after December 12, we can still guarantee pre-Christmas/Hanukkah arrival within the U.S., but only if you specify expedited shipping (choose overnight or 2-Day). And we'll be working until December 22 to make that happen. You'll find tons of Springsteen-related stuff in our online store for any Boss fan on your list: 2006 Springsteen calendars, Garry Tallent's Christmas CD, Bruce CDs reissued in Japan in beautiful mini-LP sleeves, and other new additions.... plus concert T-shirts, DVDs, books, CDs, back issues of Backstreets Magazine, and much more in our online catalog. GOIN' OUT WEST: LIGHT OF DAY COMES TO L.A.
Get half-price tickets with a Backstreets discount code! For the first time, Bob Benjamin's "Light of Day" benefit series is leaving New Jersey, for a special West Coast concert. 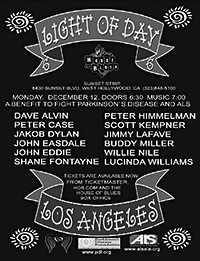 This Monday night, December 12, at the House of Blues on the Sunset Strip in L.A., it's a stellar line-up of roots-rock singer/songwriters, including Lucinda Williams, Dave Alvin, Peter Case, Jakob Dylan... and lest you think LOD has totally "gone Hollywood," that roster includes "Friends of Bruce" like Shane Fontayne, John Eddie, Willie Nile, and Jimmy LaFave. As with the East Coast events, this Light of Day concert is raising funds to combat Parkinson's Disease and ALS. If nothing else, Devils & Dust was a lock for the Best Contemporary Folk Album category; and yep, with Grammy nominations announced today, Springsteen's album gets that nod along with Ry Cooder, Rodney Crowell, Nickel Creek, and John Prine. But he garnered a total of five nominations this time out, tying more mainstream hitmakers like U2 and Gwen Stefani. Perhaps the biggest surprise is the title track's nomination for Song of the Year, the big songwriting award, up againts U2's "Sometimes You Can't Make it on Your Own," Mariah Carey's "We Belong Together," John Legend's "Ordinary People," and Rascal Flatts' "The Broken Road." "Devils & Dust" also received nominations in two more fields: Best Rock Song and Best Solo Rock Vocal Performance. And the album's "flipside" brings Bruce's fifth nomination -- and an honor for video director Danny Clinch and video producer Lindha Narvaez -- with the DualDisc's DVD content up for Best Long Form Music Video. That one's quite a race, with Dylan & Scorsese's No Direction Home, R. Kelly's Trapped in the Closet, End of the Century: The Story of the Ramones, and Brian Wilson Presents Smile. The 48th Annual Grammy Awards will be held on Wednesday, Feb. 8, 2006, at the Staples Center in L.A., broadcast live on CBS. See today's press release and the full list of nominees. This week marks 25 years since the death of John Lennon, on 12/8/80. For Springsteen and the E Street Band, who had played a show that night at the Spectrum in Philadelphia and were booked to play the following night as well, the show had to go on. 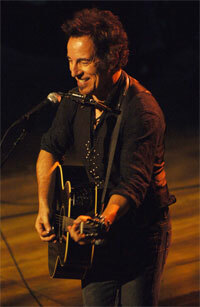 "It’s a hard night to come out and play when so much has been lost," Bruce told the crowd on 12/9. "The first record that I ever learned was a record called 'Twist and Shout,' and if it wasn't for John Lennon, we'd all be in some place very different tonight. It's an unreasonable world, and you have to live with a lot of things that are just unliveable. It's a hard thing to come out and play... but there's just nothing else you can do." This week in the Star Tribune, Springsteen names a favorite Lennon song and reflects on Lennon's death and that night in Philly. And in "Night that city stopped cold," the Daily News' David Hinckley reminds us that WNEW-FM DJ Vin Scelsa was on the air the night of 12/8, in the middle of playing "Jungleland," when he found out Lennon had been shot. See the interview with Scelsa in Backstreets #82 for more on that emotional night, and listen to WFUV on Thursday for a montage of WNEW's 12/8/80 coverage. WFUV will feature Lennon-related programming all day; the Scelsa flashback will be heard on Dennis Elsas' "City Folk Afternoon" between 2 and 6 p.m. Half-price tickets to see the 7 this weekend! While there's still no word about Holiday shows from Bruce Springsteen, the Max Weinberg 7 are playing a pair of their own again this year at B.B. King's in NYC. This Saturday night, December 3, catch the MW7 playing two holiday shows, an early show at 8 p.m. and a late show at 10:30. Tickets are onsale now through Ticketmaster. Even better... howzabout Backstreets puts you on the guest list? We've got seven pairs for the MW7's 10:30 show to give away, thanks to B.B. King's. If you want free admission for you and a guest to Saturday night's late show, just be one of the first 7 people to email me with the name of the 11th song from the MW7's self-titled album as the subject line. In the body of the email, include the name you'd like us to put on the list (each name will be +1, so the person on the list can bring a guest of their choosing). Update: Our seven slots have been filled... but tickets are still available from Ticketmaster for both shows -- and we've got a special link that'll give you 50% off. Follow this Ticketmaster link and use the offer code you'll find there to get half-price tickets to either the early show or the late show! Yes, Virginia, there is a 2006 Bruce calendar! It's official, it's a beaut -- with 12 portraits of Springsteen by photographer Anton Corbijn -- and it's in stock now at Backstreet Records. If you're gearing up to shop for your favorite Boss fan, our online catalog is packed with a wide variety of Springsteen stuff, just waiting for a stocking near you. We've also got that new Uncut magazine from the UK, with a great cover feature on Born to Run... those meticulously crafted Japanese CD reissues... Gary Tallent's new Christmas compilation CD (To:Kate) ... and of course, the 30th Anniversary BTR box set. Check our latest arrivals page for lots more. And then there's our regular stock, with more official CDs, videos, books, vinyl, and concert shirts than you can shake a stick at. The gift that keeps on giving, of course, is a subscription to Backstreets Magazine-- and using our online gift subscription form, you can type in a message to go on the gift card that will accompany your lucky giftee's first issue. Back issues of Backstreets make a fine stocking stuffer, too. And whether you're looking to spend a little ("Santa Claus is Comin' to Town" on CD-single) or a lot (get the full set of Japanese CD reissues and get $70 off! ), we've surely got something that'll fit the bill. Run, Run, Rudolph! : For orders placed by December 12, we can guarantee standard delivery to any U.S. address will arrive in time for Christmas. If you order after that date, or simply need something faster, we offer 2-day and Overnight service at a reeeeasonable price. Of course, we ship all over the world, and while we can't guarantee the timing of an international shipment (if you're having something sent outside of the U.S., we recommend ordering as early as possible if you're hoping for delivery before Christmas), we'll be working hard this holiday season to fulfill orders as quickly as possible. Check out our online catalog, thanks as always for your support, and have a Happy Thanksgiving! 11/22: THE LAST DANCE... BUT YOU BETTER NOT POUT, YOU BETTER NOT CRY! After a remarkable seven months, a tour which was in many ways a fulfillment of the promise of the 1990 Christic Institute benefit shows, we found ourselves tonight at the Last Dance (the Donna Summer song even played over the P.A. when the lights went down.) Like other Springsteen tour-closers of recent years, it was a somewhat meandering show; and it was surprisingly similar to the previous night, including the opening Link Wray tribute, "Rumble," the new arrangement of "Saint in the City," and "Song for Orphans" with Alan Fitzgerald, "the man behind the curtain," returning on the keys. But when this show diverged, it diverged: gotta love four tour premieres at a tour finale. The first came as Bruce sat down at the piano for the first time: "I'm gonna play something tonight I've never played before. Can't let the night pass without one of those!" And while Bruce has actually played "Zero and Blind Terry" before, back in '73 and '74 with the E Street Band, this Tracks tune was near the top of the snowball's-chance-in-hell list until tonight. (Even better, it went right into a magnificent "Backstreets," also at the grand, the only audible of the night.) #2 was "Fire," a stripped-down, playful performance on the harp and bullet mic that was also a nod to the late, great Wray (he and Robert Gordon covered the Springsteen tune on 1978's Fresh Fish Special). 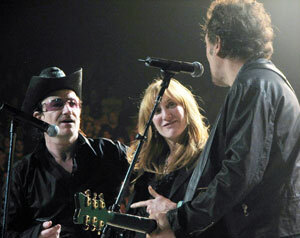 For #3, Bruce brought out his "way better half," Patti Scialfa, for a duet on "Mansion on the Hill." (With that performance, just squeaking in under the wire, Bruce has played every song from Nebraska on the Devils & Dust tour.) And for #4, it was the real "attack of the relatives," as Patti came back onstage along with about 15 more friends and family members for "Santa Claus is Comin' to Town." Their kids were part of the throng, Sam sitting on the piano bench next to his dad, as everyone shook tambourines, jingled bells, and sang along for this official start of the holiday season. Bruce had noted the kids' presence in the crowd earlier in the show, as he introduced "Long Time Comin'": "I got my babies in the house tonight, so I'll send this out to Evan, Jessie, and Sam... Daddy's coming home!" (He later dedicated "The Promised Land" to Evan, and "Dream Baby Dream" to Jess.) Bruce had several more shout-outs before this last dance was through, thanking "everyone for giving me a good year," thanking all of the tour crew (even coaxing guitar tech Kevin Buell out for a quick wave), Terry Magovern, and "all the fans": "I really love playing like this... but to do it, you really need a great audience -- and I've had great audiences this year. You did a good job -- and it's a job! That's hard listening! 'We're not talking! We're listening!'" Anytime, Bruce, anytime. And some rare final words as the last "Dream Baby Dream" droned to a close: "See you up the road!". Happy Birthday to the cooloest little deejay in the U.S.A., Steven Van Zandt, born November 22, 1950. MAYBE THEY VOTED FOR IT BEFORE THEY VOTED AGAINST IT? And perhaps now that Corzine is leaving the Senate to become governor of the great state of New Jersey, he can revisit the efforts to make "Born to Run" the state song. "Baby, this town rips the bones from your back..." Anyone? Anyone? Tired of watching 30-year-old clips? Okay, us neither. But how about something from last night? Catch video from the 11/16 Meadowlands concert -- including clips of "Devils & Dust," "Long Time Comin'," and "Backstreets" -- online now at www.nj.com. Don't forget, Bruce guests on Fresh Air with the fabulous Terry Gross today -- always a great interview, and we bet he'll be nicer than Gene Simmons was. Check your local NPR station to listen, or tune in online after 3 p.m. today. Quite a spread in today's New York Times: "Born to Run reborn 30 years later" by Jon Pareles is online, along with a multimedia feature that includes a) video of Pareles' interview with Jon Landau; b) the "She's the One" live clip; and c) a visit with a group close to our heart, the Friends of the Bruce Springsteen Special Collection at the Asbury Park Public Library, as they work to preserve some Springsteen history. You can't throw a rose in the rain without hitting Bruce press elsewhere either, including articles and reviews in the Hartford Courant, the Asbury Park Press, the Courier Post, New York Newsday, the Chicago Tribune, the Buffalo News... And don't miss articles that ran last week. It's also "Bruce Week" on 90.5 "The Night," the Brookdale Public Radio station that had a drop-in from Bruce last month; see the week's schedule and hear the interview online now. 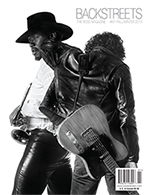 Clarence Clemons talks with the Palm Beach Post: "My face was on the back. Why not on the front? What's up with that?... So finally Born to Run comes out and it's huge and I showed it to my mom and she said, 'Your behind's on the cover!'" Just a few more days to get your pre-order in for the BTR box -- visit our online shop! Press coverage in the Wall Street Journal includes some talk from Springsteen and Landau. The New York Post has gone to town -- read their stuff here, here, here, and here. Also read Jay Lustig in the Star-Ledger; Steve Morse in the Boston Globe. Don't forget the upcoming CBS Sunday Morning segment on 11/13. Springsteen has spoken with Terry Gross for NPR's Fresh Air, scheduled to air on Tuesday 11/15. If you're in the NYC area, check out the midnight release party at Tower Lincoln Center, starting at 11 p.m. on Monday, where they'll be spinning rare and vintage Springsteen recordings to get fans in the mood. Brian Hiatt spoke with Springsteen, Landau, and "Boom" Carter for "Bruce gets 'Born' Again" in the current issue of Rolling Stone -- read it now at RollingStone.com. "Springsteen Reflects on 'Born to Run'" with Larry McShane for the Associated Press. Hearing all the outtakes and (nightly!) bootlegs being played on Sirius, you might think you've landed in some kind of Bizarro Universe. But no, this is really happening: Springsteen has given the greenlight to Sirius to air fan recordings on their E Street Radio channel 10. All these long-coveted, much-traded documents of Springsteen's live shows and studio cast-offs, on the radio -- and what's more, you can help play DJ. Check out the weekly poll right here on this page -- for each week that E Street Radio is on the air, Backstreets readers will be choosing which show they'll play on Friday night! Just cast your eyes to the right for the poll, exclusively on Backstreets.com, where the choices will be changed each week. This is the kind of November vote we can all get behind. 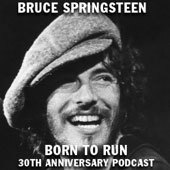 For a preview of the documentary portion, check out the Born to Run 30th Anniversary podcast. This 7-episode series, culled from the box set's Wings for Wheels DVD, takes you from inception to completion of the album through audio highlights. Subscribe to the podcast series in iTunes, or visit this link. An edit of that Wings for Wheels material has also been prepared for radio, as an audio documentary called The Story of Born to Run. The one-hour special will be airing on "terrestrial" radio stations (including Philly's WHYY, on 11/14 at 11 pm; check with your local station to request the program or find out when it's airing) as well as on XM Satellite Radio's channel 50/The Loft, beginning Tuesday 11/8 at 9 p.m. Eastern. Watch for a Bruce segment, including some filming done last week in Boston, on the upcoming CBS Sunday Morning, November 13. Don't miss a chance to see it on the big screen! Tickets are on sale now for the one-night-only movie theater showing of selections from the Hammersmith and Wings for Wheels DVDs. The movie will be playing in 59 theaters across the U.S. on November 14, the night before the box set is released. Visit bigscreenconcerts.com for theater locations and to buy tickets. Watch the trailer now. Springsteen's concert scheduled for Thursday night in Sunrise, FL has been postponed and moved to a new venue: Seminole Hard Rock Live Arena in Hollywood, FL on November 19 (between the CAA and Trenton shows). For those with tickets to the original BankAtlantic Center show, credit cards will automatically be refunded for the ticket price and convenience charges. An exclusive Ticketmaster.com presale for those previous ticketholders will begin on Monday, November 7, at 5pm and will end on Thursday, November 10 at 5pm. Your password for this exclusive presale will be your Ticketmaster confirmation number from your BankAtlantic Center Bruce Springsteen order. This presale is being set up to offer you comparable seating from your previously purchased order; for example those who purchased tickets in the premium area will only be able to re-purchase seats in the premium area. If you had seats on the floor you will have the opportunity to re-purchase seats on the floor. For patrons who had bowl seating, you will be able to re-purchase bowl seating. Please keep in mind that the seating arrangements at the Seminole Hard Rock Live Arena are not the same as the BankAtlantic Center, so exact seating location on this new purchase are not guaranteed and seating is based upon availability. See our Tour/Ticket Info page for the current itinerary and links. Theatre locations have been posted for the November 14 Regal Cinemas showing of selections from Hammersmith '75 and Wings for Wheels. See bigscreenconcerts.com for the complete list; tickets are scheduled to go on sale Friday. Sirius Satellite Radio's E Street Radio kicked off today at noon with "Born to Run," beginning a 24/7 broadcast that will run for the next three months -- listen at 4 p.m. today for Dave Marsh's new interview with Bruce. With South Florida still recovering from Hurricane Wilma, many fans are wondering about Bruce's scheduled November 3 show at the BankAtlantic Center in Sunrise, FL. At the moment it is still on -- but since tomorrow night's Depeche Mode concert at the same venue has just been cancelled, we'll be keeping a close eye on this one. Watch this page and the Sun-Sentinel for any updates. While the E Street Radio channel (see below) doesn't begin on Sirius until Tuesday, 11/1, Dave Marsh's new interview with Springsteen will premiere this weekend, on Marsh's weekly "Kick Out the Jams" show. "Kick Out the Jams" airs on Sirius channel 103, Sunday from 10 a.m. to noon, and again from 1 p.m. to 3 p.m. and Monday from 1 a.m. to 3 a.m. Happy Birthday to Garry Wayne Tallent, born October 27, 1949. Helping out For Kate's Sake is clearly one of his birthday wishes -- if you want to help make that one come true, support his new benefit project and pick yourself up a fine Christmas album! Getting the Hammersmith and Wings for Wheels DVDs in just a few weeks is cool enough... but here's the cherry on top: the night before the official release of that Born to Run box, you might just have a chance to preview them on the silver screen. Big Screen Concerts is presenting a showing in Regal Theaters across the country on November 14, an 85-minute edit of selections from the two DVDs. The flick will show at 66 theatres around the country, and we hope one near you... We should have a list of theater locations around November 1, with tickets going on sale November 4. Stay tuned! And on the small screen: Another edit of the Hammersmith footage will air on PBS in December, a 60-minute version with 8 songs. We're told: "Contact your local PBS station at www.pbs.org/stationfinder to find airdates in your area for Bruce Springsteen & the E Street Band: Hammersmith Odeon, London '75. If your station does not have this special scheduled please call or write them to let them know you want to see Bruce Springsteen on TV in your town! Once a station sees public demand for a show it might convince them to schedule it." Anytown: Stories of America, an evening of dance set to the music of Springsteen, Scialfa, and Tyrell, comes to the Count Basie Theatre in Red Bank this Saturday, October 29. It's the last scheduled performance until 2006 -- check it out if you can! See our concert calendar for all performance dates, Backstreets #82 for a preview article/review, and the Shapiro & Smith Dance website for more information. You're driving in your car... you turn on the radio. Well, if you've got Sirius Satellite Radio, you'll be able to drive all night -- and all day, and all night again -- to the sounds of nothing but Bruce and the E Street Band. Timed to coincide with the 30th anniversary of Born to Run, Sirius has announced the November 1 launch of E Street Radio, its exclusive new commercial-free channel devoted to the music of Bruce and the E Streeters. E Street Radio will feature rarities, track-by-track album discussions, behind-the-scenes insights, and conversations with E Street Band members and others associated with Springsteen throughout his career -- including an exclusive interview with the Boss conducted by Dave Marsh (who also hosts the weekly Sirius program "Kick Out the Jams"). E Street Radio is planned for a three-month run, through January 31, 2006. 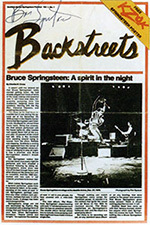 It was a quarter-century ago tonight that the very first issue of Backstreets made its way into the world, at the Seattle stop of the River tour. Since then we've been through four offices, three hometowns, 82 issues of the magazine (with the anniversary double issue 83/84 coming soon), two websites (anybody remember the aol/joeroberts Backstreets Highway site? ), at least 11 message machines for the Backstreets Boss Hotline... and way more subscribers and supporters than any of us could have imagined back in the newsprint days. Thanks to everyone who's been sharing the ride these last 25 years. As luck would have it, we get to celebrate in style tonight, with a Devils & Dust concert just up the road in Richmond. Here's to good rockin' tonight -- and to another 25 years. Hey, we gotta dream baby dream. Hi Ho Silver-o! Celebrate the silver anniversary of Backstreets with this limited edition anniversary T-shirt, available for a short time from our online shop. This black tee has a license plate image on the back and hubcap on the front, with "25th Anniversary" type. We only printed a very limited run, get 'em while they last! 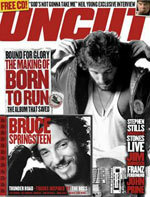 The UK's Uncut magazine celebrates the 30th anniversary of Born to Run with a cover feature in their November issue, just hitting U.S. newsstands now. The story of the making of the album is accompanied by exclusive portraits from Born to Run photographer Eric Meola. An attached CD features tracks inspired by the Boss, including the Cowboy Junkies, Tom Russell, John Hiatt, Steve Wynn and more. Also coming from the UK, in just a couple months, Springsteen will return to the cover of MOJO magazine, with an interview by Phil Sutcliffe, due in January. A bonus CD is planned to include arists who influenced Bruce, including Hank Williams, Leadbelly, and the Stanley Brothers. The URL you have requested DOES have a web site associated with it. In addition to the upcoming 6th annual Light of Day concerts in New Jersey (November 4-6), Light of Day will shine outside of Jersey for the first time. The show will hit the road for additional LOD events in Rome (late November, featuring Antonio Zirilli and Thundercrack) and Los Angeles (December 12, featuring Dave Alvin, Peter Case, Jakob Dylan, John Eddie, Garland Jeffreys, Scott Kempner, Jimmy Lafave, Jesse Malin, and Willie Nile. Watch www.lightofday.org for further details. November 4 Stone Pony: Bill Toms & Hard Rain, Boccigalupe & the Bad Boys, Danny White, Gary U.S. Bonds, La Bamba's Big Band, Maybe Pete, Pete Yorn Band, Soozie Tyrell, and Southside Johnny, and more. November 5 Starland Ballroom: Boccigalupe & the Bad Boys, Exit 105, Garland Jeffreys & the Coney Island Playboys, Jennifer Glass, Jesse Malin Band, JoBonanno & the Godsons of Soul, Joe D'Urso & Stone Caravan, Joe Grushecky & the Houserockers, Willie Nile & more. November 6 Starland Ballroom (all acoustic "Light of Day in the Raw): John Eddie, Jeffrey Gaines, Joe Grushecky, Jesse Malin, Pete Yorn, Dawne Allyne, Joe D'Urso, Pat Guadagano, Rob Dye. This year, in addition to benefitting the Parkinson's Disease Foundation (and celebrating Bob Benjamin's birthday) as usual, Light of Day will celebrate the life of Joan Dancy. Dancy, the late fiance of Terry Magovern, passed away in July from ALS, and funds raised by Light of Day 6 will also go to the Greater Philadelphia Chapter of the ALS Association.Tickets for all three shows will go sale this Saturday, 9/17 at noon through Ticketmaster outlets, Ticketmaster Charge By Phone, www.ticketmaster.com, and Vintage Vinyl in Fords, NJ. Tickets for the 11/4 concert will be available at the Stone Pony box office, while tickets for 11/5 and 11/6 will be available at the Starland box office. Three-day passes will be available through Ticketmaster outlets only. For additional information, visit concertseast.com. Out comes Springsteen's 1973 Max's Kansas City performance archived by King Biscuit Flower Hour, on the radio this week as part of their Springsteen/Gary U.S. Bonds show. It's unclear whether this will be a complete airing of what DIR recorded back on 1/31/73, but King Biscuit tells us that the broadcast will at least include "Spirit in the Night," "Does This Bus Stop at 82nd Street," and "Thundercrack." Airtimes vary, but in most markets, the program will be on this weekend: visit the KBFH website for station schedules, and check out Brucebase for further details on the show. And oh yeah... roll your tapes! Just released today, To: Kate: A Benefit for Kate’s Sake is a brand new Christmas compilation CD put together by E Street bassist Garry Tallent. Garry gathered a host of Americana music’s most noted singers, songwriters, and musicians for the record, including Buddy & Julie Miller, Joe Ely, Jason & the Scorchers, Raul Malo, Steve Earle & Allison Moorer, and John Prine. It’s a pretty even mix of new, original Christmas songs along with some different takes on well-known favorites -- great stuff. And Garry himself produced and played bass on half of the tracks. The project benefits For Kate’s Sake, a fundraising effort to help the Kirk family of Nashville, whose two little girls, Kate (3) and Caroline (6), are both afflicted with a rare and fatal genetic disorder called Neimann-Pick Disease Type A/B. Garry says, "Our hope is to raise money for this cause while spreading some cheer in the process." 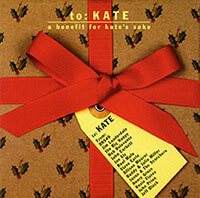 All royalties from this album will go to the Children’s Organ Transplant Association (COTA) and to "For Kate’s Sake." For the full track listing, and to order, visit our online shop. Backstreet Records will be donating all profits from the sale of this album to For Kate’s Sake. Chuck Cherico tells us: "After the first encore break, Bono asked, 'Where's the guy with the "People Get Ready" banner?' A guy just outside of the tip of the ellipse started jumping up and down, holding up his banner again. Bono said, 'But we need someone to play guitar!' I looked back toward the stage again and saw that a roadie was helping some guy put on a guitar. I assumed it was a fan from the audience who was having his dream come true. But then I took a closer look and saw that it was...Bruce Springsteen. The crowd went berserk." After Bruce took a verse and dueled with the Edge on guitar, Bono had plenty more lyric changes up his sleeve, coaxing Patti Scialfa out onstage as well (see U2.com for Bono's customized verses). Paul Callahan writes: "Bono included some 'Turn it up's from 'Mary's Place' and said, 'We are not a jamming band. How do you end this?' Bruce took over from there, and as Bono left with Patti (to Bruce's mock displeasure), Bruce ended with 'People get ready, there's a train to Jersey...' which ended the spectacular song to great roars from the Philly crowd." Check out amazon.com for an exclusive preview from the upcoming Hammersmith '75 DVD (part of the Born to Run 30th Anniversary reissue). Amazon has a full clip of the "Born to Run" performance, streaming online now! To pre-order the box set through Backstreet Records, visit our online shop and get 10% off. Good news -- the 30th Anniversary Born to Run reissue, due November 15, has just had its official list price lowered from $49.98 to $39.98. We've adjusted our price accordingly, keeping our pre-order discount of 10% off, so our price is now even lower: just $36. And if you've already placed your order with us, don't worry -- we'll be adjusting all orders to the new, lower price. A little more work for us, but it's a nice bit of savings to pass along to everybody. If you haven't ordered yet, this three-disc box set (including two DVDs) will be a must have -- check out more details and place your order now in our online shop! On Sunday, October 16, a special performance by Bruce in the U.S.A. at The Roxy in L.A. will mark exactly 30 years since Sprinsgteen's legendary stand began there back in 1975. To celebrate, Matt Ryan and the band will be taking on the Born to Run album in its entirety as part of the show. The event will be hosted by Adam Carolla, featuring special guests (all the way from Asbury Park!) Boccigalupe and the Badboys. All proceeds will be donated to the Red Cross, to benefit victims of Hurricane Katrina. For more info, visit bruceintheusa.com. 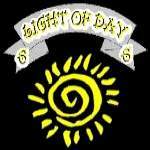 Also on the concert calendar: details for Light of Day 6 -- tickets still available! 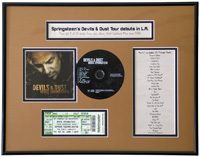 With the fall leg underway, you may want to check out That's My Ticket -- they'll capture the memory of your favorite Springsteen show with a unique Ticket Frame that includes show-specific set lists, headlines, and a place for your actual ticket stub. Whether you saw the Chicken Scratch tour or a Devils & Dust show, if you got the stub... Ticket Frame it. Head to Thatsmyticket.com for details and to order. Mention "Backstreets" in the comments section and save $10 off each Ticket Frame. The day before his benefit concert for the New Jersey chapter of the American Red Cross, Bruce Springsteen stopped by the studios of Brookdale Public Radio (90.5 WBJB) Monday afternoon to show his support for the station's Fall Membership Drive. WBJB is located in Lincroft, NJ--a stone's throw from Red Bank--and affiliated with Brookdale Community College. Springsteen seemed quite pleased to be able to help with their fundraising, apparently calling music director and dj extraordinaire Jeff Raspe that morning to see if he could swing by. Bruce spent about 20 minutes on the air with Raspe, chatting up a wide range of subjects, but mostly focusing on Springsteen's love and support for the station. Hey, the man's got it preset on his car radio! 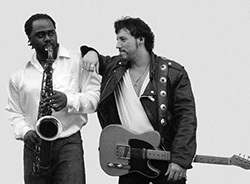 Springsteen credited the station for playing a wide variety of music, and even turning him onto new artists and songs. Springsteen played "All the Way Home" and "If I Should Fall Behind" on an acoustic guitar live in the studio, the latter closing his segment...but not before 90.5, also known as "The Night," got a station ID to remember, and hopefully be able to use, for some time. Pretty cool hearing Bruce giving out call letters and a telephone number to use to make your pledge. At this point the impromptu visit is not available for listening on The Night's website --they have put up artist in-studio visits before, so it might show up there soon --but it's not too late to make that pledge! BACKSTREETS SPECIAL DOUBLE ISSUE COMING SOON! If you hang around long enough, it seems there are anniversaries around every corner. This year, there's the Born to Run 30th, of course... and let's not forget The River's 25th and The Ghost of Tom Joad's 10th! 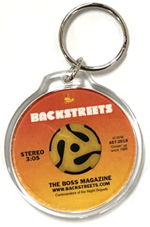 And there's one more on our mind: Backstreets magazine will celebrate our silver anniversary this fall, marking 25 years since the first issue was distributed at the Seattle stop of the River tour. To mark the occasion, we're currently putting together a special double issue. If you think it's been a while since our last issue, you're right -- and it's because we've been loading this sucker up for our biggest issue since... well, since the last double issue that marked our 20th anniversary. And by the way: that issue, #68/69 sold out faster than any other we've published. We'll be releasing #83/84 in a matter of weeks, so don't miss the boat on this one -- subscribe now if you haven't already. And if you need to update your mailing address or place a classified ad, now's a good time. The Devils & Dust tour officially resumes next week on October 6 in Rochester. But Springsteen will be back on stage even sooner than that: it's just been announced that he'll be returning to the Paramount Theatre in Asbury Park on Tuesday, October 4, to play a benefit for the Jersey Coast Chapter of the American Red Cross. Ticket alert: Tickets go on sale this Friday, 9/30, at 9 a.m., by Ticketmaster phone only. Tickets are $100 each, with a limit of two per person; all are will call only, with two forms of ID required to pick them up. See our Tour/Ticket Info page for further details. Pre-order now from Backstreet Records for 10% off! Finally, the world is ready for the Born to Run 30th Anniversary reissue. 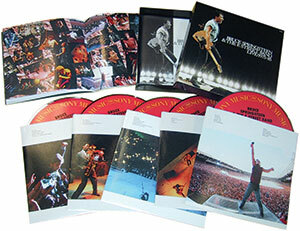 Due on November 15, the box set will include three discs: "Hammersmith Odeon, London '75," an astonishing film of Bruce Springsteen and the E Street Band's legendary November 18 concert; the new documentary film "Wings For Wheels: The Making of Born To Run;" and the classic album in remastered CD form. With its two DVDs, the package offers approximately four hours of previously unseen footage. Personally supervised by Bruce Springsteen and Jon Landau, the set includes a 48-page photo album of previously unpublished photographs, with an introduction written by Springsteen. In newly shot footage from Asbury Park, NJ, Springsteen discusses his personal feelings about the making of the iconic album in great depth; the footage with Springsteen includes the musician reflecting on outtakes and unreleased tracks from the album for the first time since 1975. The DVD ends with stunning bonus footage of three songs recorded live at Los Angeles' Ahmanson Theater in 1973: "Spirit in The Night," "Wild Billy's Circus Story" and "Thundercrack." The newly remastered Born to Run CD rounds out the box set. This is the first time Springsteen has allowed any of his catalogue to be fully remastered, and he enlisted his longtime mastering guru Bob Ludwig to handle the job. The newly remastered version presents the masterpiece with striking clarity and presence. Official release for the box set is November 15, with a list price of $49.98; get our SALE price of $45 when you pre-order now from our online shop! Ah, the boo-galoo down broadway that almost was... Alicia Keys, one of the great young voices in R&B today, was hoping for a Boss rendezvous to top off her new MTV Unplugged performance. As Jonathan Cohen reports in Billboard, "the project nearly got a major lift from rock legends Bruce Springsteen and Keith Richards, who had to back out at the last minute." It's not that they don't know her name; Keys tells Billboard, "I was going to cry... Bruce and I were going to do 'New York City Serenade' but the schedule just conflicted. And with Keith, the day the show taped was the day the Stones started rehearsal for their tour. But it was really lovely to reach out to people I admire and for them to be so down to do it." Keys' Unplugged debuts tonight on MTV. Exactly 30 years ago, touring for the brand new Born to Run on 9/23/75, Springsteen and the E Street Band played their very first "Detroit Medley." 56 years ago, on 9/23/49, Springsteen gave his very first vocal performance. Happy birthday, Bruce! The Minnesota-based nonprofit Blue Jeanne, Inc. (as in "Hey little dolly" from "Ramrod") is bringing their Rock The Cure concert event to Joe's Sports Bar in Chicago. "Show a little faith, there's magic in the night" is the theme as the Twin Cities band Lucky Town with special guest John Eddie play Chicago's Joe's Sports Bar on Saturday, October 1. Joe's is donating 100% of the night's cover charge, which will go to the Susan G. Komen Breast Cancer Foundation Chicagoland Affiliate, and proceeds from hat and shirt sales will be donated to local breast cancer charities as well. Only 200 limited edition, Bruce-approved logo shirts will be available, so get yours early! For more info, visit rockthecure.org. For more tour dates for John Eddie, Lucky Town and other related artists, as always, see our concert calendar. For the sixth year in a row, the Light of Day concerts are being held in early November. This year, in addition to benefitting the Parkinson's Disease Foundation (and celebrating Bob Benjamin's birthday) as usual, Light of Day will celebrate the life of Joan Dancy. Dancy, the late fiance of Terry Magovern, passed away in July from ALS, and funds raised by Light of Day 6 will also go to the Greater Philadelphia Chapter of the ALS Association. Tickets for all three shows will go sale this Saturday, 9/17 at noon through Ticketmaster outlets, Ticketmaster Charge By Phone, www.ticketmaster.com, and Vintage Vinyl in Fords, NJ. Tickets for the 11/4 concert will be available at the Stone Pony box office, while tickets for 11/5 and 11/6 will be available at the Starland box office. Three-day passes will be available through Ticketmaster outlets only. For additional information, visit concertseast.com. Update: A typo in the contest rules has been fixed -- the official entry deadline is September 30, at 2:59:59 p.m. PT. A bunch of Bruce fans sittin' around talkin'... and rockin'. Just back from the Glory Days Springsteen Symposium, a whirlwind weekend of impassioned Bruce talk, debate, insight, sights & sounds. High points, too many to name, included an opening talk and significant involvement all weekend from Dave Marsh; Colleen Sheehy's fascinating conversation with photographer Frank Stefanko, highlighted by many unseen photos (including a stunning peek at Stefanko's November 2004 photo shoot with Springsteen, some striking weight-of-the-world shots); BBC Music Entertainment Executive Producer Mark Hagen's presentation of his 1998 "A Secret History" documetary; Bob Santelli reminiscing with Danny Federici and Vini Lopez; and just a wealth of presentations, perspectives and discussions with fans, authors, musicians, teachers.... Kudos to Mark Bernhard and everyone involved for an inarguable success -- this conference was the first of its kind, and by its end the main question on everyone's lips was, "When are we doing this again?" A couple of late additions included the always engaging Bobby Muller (regaling the Saturday night dinner crowd with the story of Springsteen's involvement with the Vietnam Veterans movement, as well as addressing the current war) and -- perhaps the most "newsworthy" event of the weekend-- a surprise visit from Thom Zimny. 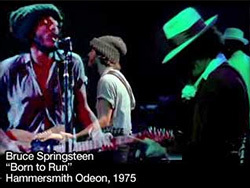 The editor of all of Springsteen's recent concert films (Live in New York City, Live in Barcelona, VH1 Storytellers), Zimny brought a treat for the conference crowd on Sunday: a sneak peak of the Hammersmith Odeon DVD, which will present the complete 11/18/75 London show as part of the upcoming Born to Run 30th Anniversary reissue. Yes, we've finally gotten official confirmation of at least some of the much-rumored additional content for this package, and what better confirmation than two songs played in full, "She's the One" and "Quarter to Three" -- in full color and at full blast. Just days before the London show, Mike Appel approached Mike Appleton (original producer of the Old Grey Whistle Test) and asked if he'd film the performance. Most of the reulsting 16mm negatives sat in a storage locker -- in unlabeled cannisters -- for the better part of 30 years, until Zimny was asked to work his magic. You might have already seen some circulating footage from the show... but you ain't seen nothin' yet. Zimny spent the better part of a year piecing together footage from three cameras, restoring it frame-by-frame, synching it up with pristine audio (mixed by Bob Clearmountain in both stereo and surround), and the result is a jaw-dropper. In addition to the London video (runnning time: 2 hours, 9 minutes), DVD content for the 30th Anniversary of Born to Run will also include a documentary about the making of the album, directed and edited by Zimny with interviews by the BBC's Hagen. Zimny and Hagen were both onstage for the Sunday afternoon presentation, answering questions as much as they were able... like, release date? Sometime before Christmas. Good enough for now. Let the salivating begin. Ticket sales for the fall U.S. leg of the Devils & Dust tour begin tomorrow! Most shows go on sale Saturday morning 9/10, but a few are scheduled for Friday 9/9 and Monday 9/12. See our Tour/Ticket Info page for further details. With Wave Three just released, the Japanese "mini-LP sleeve" CD reissue series is complete! The third wave (five albums from Greatest Hits through The Rising, including the triple-gatefold Live in New York City, above) is in stock now at Backstreet Records. These meticulously reproduced CD packages from Sony Japan recreate the original vinyl LP packaging (including all inner sleeves, lyrics, photos, etc. ), shrunk down to CD size. If the LP sleeve was gatefold, it's gatefold here; if there was a sticker, there's a sticker. 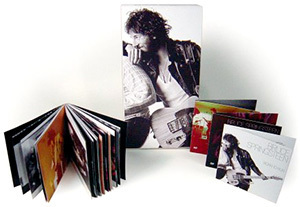 The first wave of the series included Springsteen's six albums from Greetings through Nebraska (including the gatefold Born to Run, above right). The second wave covered the six albums from Born in the U.S.A. through MTV Plugged (including the deluxe 5-CD Live/1975-85 box, pictured below). All 17 titles from all three waves are now in stock, and we're still taking orders. Quantities are limited, so get 'em while they last. While Sony Japan can be counted on for excellent sound, please note that these reissues have not been remastered in the standard sense of the term; but for the best available sound to date and some rockin' packaging, these rarities are highly recommended. You can pick and choose, or we've got package deals available for each wave -- and the best deal for the full set of 17 CDs. Visit our online shop for more details and to order! Also new to our shelves: the Storytellers DVD, just released today; the summer 2003 Rising tourbook; new Cowboy Junkies CD with two Springsteen covers; and more. See all the latest additions in our online shop. And if you're looking for a way to lend a hand with hurricane relief, check out "The How To Help Thread" on our BTX message boards. It's a good place to start for information on how to help those who need it. Sorry, no "Springsteen on Ice"
As expected, one correction to the tour itinerary: with the Flyers playing a home game at the Wachovia Center, the November 8 Philadelphia concert will be held at the Wachovia Spectrum. For the complete itinerary, as well as onsale details as they come in, see our Tour/Ticket Info page. Due to continued interest, registration for next weekend's "Glory Days: A Bruce Springsteen Symposium" has been extended and will conclude at 8 am EST on Tuesday, September 6. People can still register at the time of the conference, on-site on September 9, 10 or 11, but the prices will be increased. Visit the conference website to register. For those interested in only attending the concert events at The Stone Pony associated with the conference, those advance sales will end at 5 pm EST on Thursday, September 8. Tickets will likely be available at the Stone Pony on the evening of each performance, but again at an increased price. On Friday, September 9, Joe Grushecky and the Houserockers will headline the evening and on Saturday, September 10, Gary "U.S." Bonds will be the featured act. Visit the conference website to purchase tickets. Also, see below for other local events planned in conjunction with the conference. Official dates are in: Springsteen's fall U.S. leg will kick off on October 6 at Rochester's Blue Cross Arena, hitting a total of 17 cities and wrapping things up the week of Thanksgiving. Over those six weeks, he'll cruise up and down the East Coast, including a pair of shows in Florida, and jog west as far as Minneapolis, Chicago, and Madison. Closing out the fall leg is a New Jersey trifecta, with shows at Atlantic City's Boardwalk Hall (which Bruce first played on the Rising tour) on November 13, East Rutherford's Continental Airlines Arena on November 16, and finally Trenton's Sovereign Bank Arena on November 21. In addition to East Rutherford, Bruce will be revisiting several other key cities previously played on this tour, including the promised Boston return, as well as Philly and Chicago; CAA is the only repeat venue. "We're coming back to some of our favorite cities to make sure the fans get a chance to see how this tour has evolved over the course of the last 50 shows," says manager Jon Landau. "Bruce just keeps stretching the boundaries of his performance night after night, and the result has been some of the very best concerts of his entire career." as they come in, see our Tour/Ticket Info page. Springsteen gets Costanza'd, in the NY Daily News. Hockey coach inspired by Springsteen. BTR photographer Eric Meola in the Syracuse Post-Standard. "The third act for Steven Van Zandt" in The Observer. We'll be Cryin' if Roy Orbison doesn't get his own postage stamp... sign the petition online! Don't put him at the kids' table: VH1's Classic Thanksgiving dinner with Clarence. "The Boss of the party gets busted," Pittsburgh Post-Gazette. AOL Music picks Rock's Greatest Songwriters. Check out the Holler if Ya Hear Me blog, featuring writings from Dave Marsh and various cohorts from RRC and elsewhere... including "How a Chicana Became a Jersey Girl" by Susan Martinez and Daniel Wolff's D&D review. Bruceology: The Boston Globe covers the Glory Days symposium. Details on the new Jerry Lee Lewis album that's been in the works for a while, featuring a duet with Bruce on "Pink Cadillac," due soon. Listen to The Boss Hour Wednesdays at 6 pm on WNTI, streaming live on the web.